The designations employed and the presentation of the material in this information product do not imply the expression of any opinion whatsoever on the part of the Food and Agriculture Organization of the United Nations or of the World Health Organization concerning the legal status of any country, territory, city or area or of its authorities, or concerning the delimitation of its frontiers or boundaries. 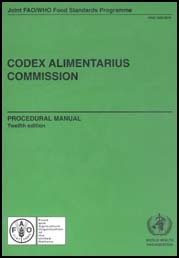 The Procedural manual of the Codex Alimentarius Commission is intended to help Member Governments participate effectively in the work of the joint FAO/WHO Food Standards Programme. The manual is particularly useful for national delegations attending Codex meetings and for international organizations attending Codex meetings and for international organizations attending as observers. It sets out the basic Rules of Procedure, procedures for the elaboration of Codex standards and related texts, general principles and guidelines for the acceptance of Codex standards by governments, basic definitions and guidelines for the operation of Codex committees. It also gives the membership of the Codex Alimentarius Commission and the addresses of Codex contact points.